Oceania Cruises take their food seriously and it shows in every Nautica dining experience. The food in all the Nautica restaurants is bursting with flavour. The Grand Dining Room is the biggest of the Nautica restaurants. It’s a classic main dining room with a wonderful old-world feel. There’s dark timber highlights and designer tapestry, as well as oversized chairs. In 2017 it was one of the Nautica restaurants that was refurbished – it got new carpet and the furniture was also refreshed. See how the food compares on Oceania Regatta. The menu changes daily, but it is always interesting and has an emphasis on classic European dishes. There is also a tasty range of light and healthy Canyon Ranch Spa Cuisine as well as gourmet vegan options. Parsnip and Truffle Cream Soup with Fresh Tarragon. Signature dishes by celebrity chef Jacques Pépin are also available. These French specialties include Steak Frites with Garlic Butter, Poulet Rôti: Herb-Crusted Free-Range Rotisserie Chicken as well as Suprême de Saumon: Poached Norwegian Salmon. We enjoyed them all. Also not to be missed is the option known as A Taste from Red Ginger. Red Ginger is the Asian specialty restaurant on Oceania Cruises larger ships. Each night the Grand Dining Room showcases one dish from the Red Ginger menu. We especially liked Red Curry Chicken with Thai Eggplant, Lime Leaves and Basil. The Seven Spices Crusted Lamb Rack was also very good. There is also a small degustation menu. It has just four courses, each paired with fine wine. The Grand Dining Room is open for breakfast and lunch, as well as dinner. This Nautica restaurant does not require reservations. The Polo Grill is one of two specialty Nautica restaurants. It is a beautiful dining room. The decor is classic, with white linen table cloths and dark timber walls, as well as high-back leather chairs. The Polo Grill embodies the spirit of the classic American steakhouse, and it also has a menu to match. Indeed, the beef and lamb dishes are exceptional. We thought the Whole Maine Lobster Steamed with Drawn Butter was sublime too. A good selection of desserts is also available. Polo Grill is one of the speciality Nautica Restaurants. This specialty Nautica dining venue is only open for dinner. It is one of the most popular Nautica restaurants, so you will need to make a reservation. However, there is no extra charge to dine at the Polo Grill. 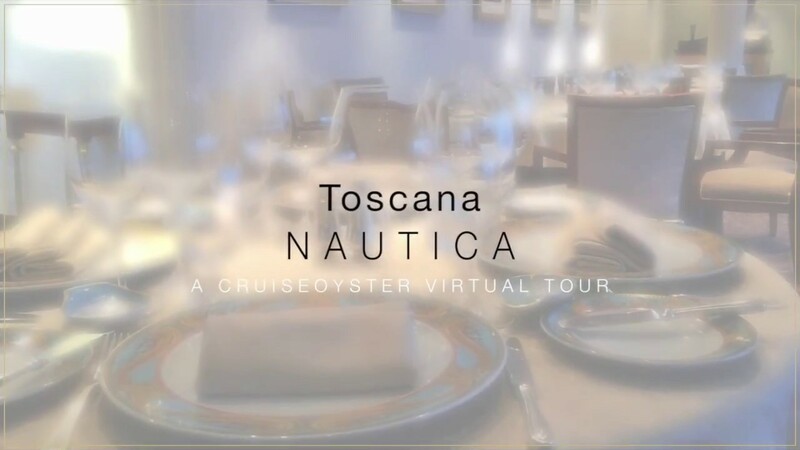 Toscana is the second of those specialty Nautica restaurants. In Italy the word for Tuscany is ‘Toscana’, so the food in this restaurant comes from that region. Damask table cloths and Versace plates set the scene for a night of classic cuisine. Toscana celebrates the food of Tuscany. In fact many of the recipes came from the mothers and grandmothers of Oceania Cruises Italian culinary staff. Highlights include Carpaccio di Polpo: Octopus Carpaccio with Champagne Vinaigrette, as well as Tortelloni di Ricotta e Spinaci: Handmade Tortelloni stuffed with Ricotta Cheese and Spinach, tossed with Chopped Roma Tomatoes and laced in Sage Butter. We also enjoyed the Aragosta Fra Diavolo: Lobster Tail sautéed with Fresh Garlic, Spicy Crushed Chili Peppers and Italian Parsley. A delightful selection of Italian desserts are also available, including Tiramisú, Panna Cotta and Cannoli di Ricotta. We rate Toscana as the best Nautica restaurant. Toscana is open for dinner only. 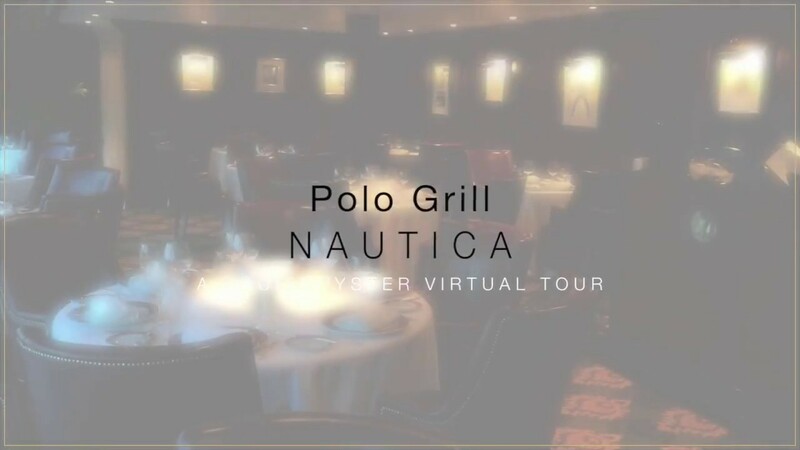 Like the Polo Grill it is a popular Nautica dining venue so you will need to reserve a table. The Terrace Café is a casual Nautica dining venue, but it has some of the the most spectacular views from its teak terrace. The Terrace Café has a large buffet menu that changes daily. It includes roasted meats and tasty seafood dishes as well as pizzas and salads. In the evening the menu steps up a notch with lobster tails and lamb chops which are cooked to order. The Terrace Café is open for breakfast and lunch, as well as dinner and you do not need a reservation. Waves Grill is next to the pool, so as you can imagine it is a super-relaxed Nautica dining option. It is open for breakfast and lunch every day. In the morning Waves Grill serves cold-pressed juices as well as healthy energy bowls. At lunch time they serve gourmet burgers and hot dogs, but if you’re in the mood for something lighter there’s BBQ seafood as well as salads.